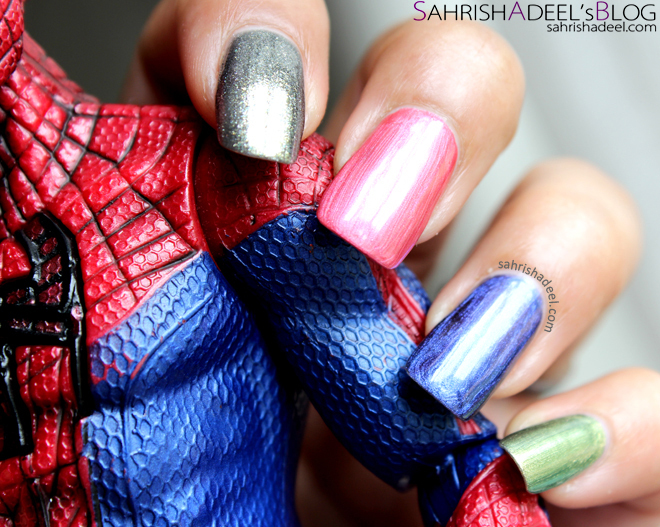 O.P.I The Amazing Spiderman Collection - Review & Swatches | Sahrish Adeel - Malaysia based Pakistani Beauty & Lifestyle Blogger! 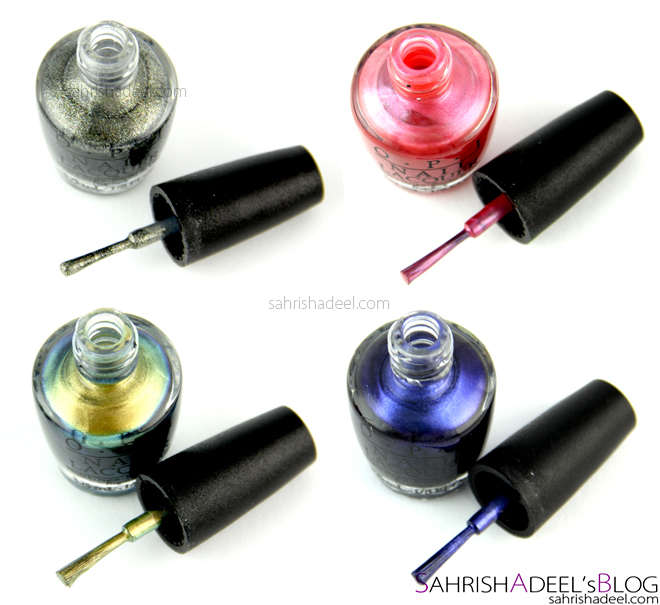 If you remember my older post on shopping experience at Daraz.pk, you would have noticed these polishes in my purchases. Choosing Spiderman collection could not get a second thought as I have a big time fan of all superheros at my home. Let's see how was my first experience with O.P.I! 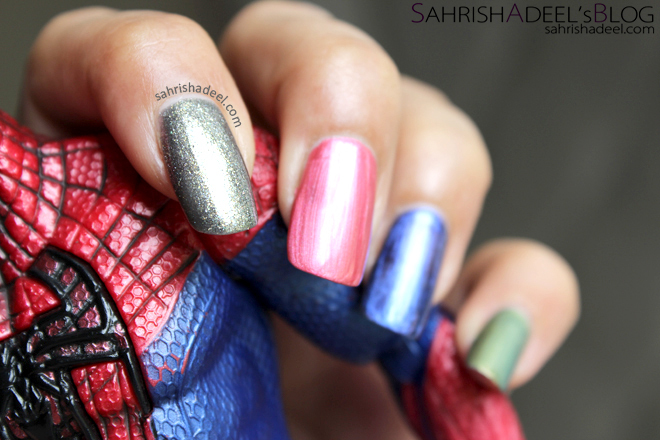 OPI The Amazing Spiderman Mini Collection is a 4 piece collection of nail lacquers in-spider-ed by the new 2012 Spiderman movie. 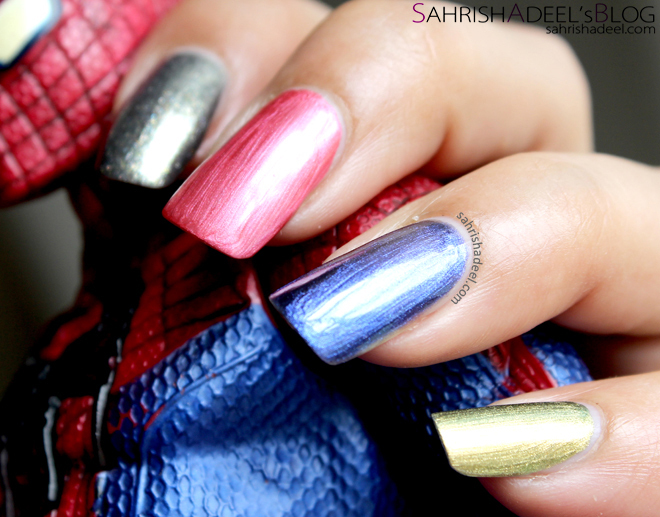 Featuring the most popular shades in miniature sizes from OPI’s The Amazing Spiderman Collection this limited edition Mini Collection features feminine pinks, classy blues and even a duo-chrome to ensure your nails are always prowl ready. Your Web Or Mine? 3.75ml - A gorgeous coral pink shimmer perfect for sticky situations. Into The Night 3.75ml - A rich blue with a shimmering finish ideal for prowling after midnight. Number One Nemesis 3.75ml - A deep sparkling grey polish to show your metallic side. Just Spotted The Lizard 3.75ml - An eye-catching green duo chrome polish, be seen in this reptilian yellow-green. This collection comes in a beautiful card box packaging that has Spiderman graphics over it. 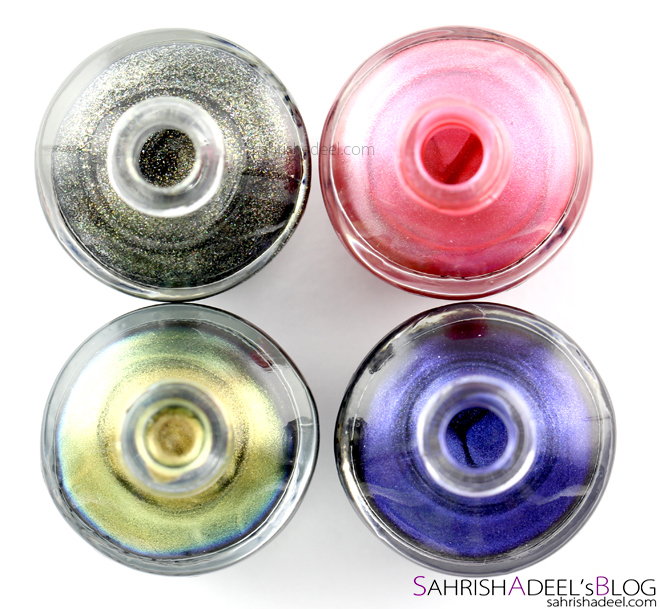 This pack comes with four mini polishes. They all have glass bottles with plastic grips and brush applicators. Each bottle contains 3.75 ml of product. All of these swatches have been taken in day light. I have applied two coats on each nail except for Into The Night, which had to be applied third time to get good opacity. Just like my son, I am also a big fan of superhero movies and having cute little polish bottles in my collection is really fun. All of these polishes have really smooth formula and they go on really nicely. The brush applicator is also pretty good to have neat application, I did not have to clean up or make a smooth line after the application. Plus, I loved the names. Your Web or Mine; has a creamy formula and goes opaque in two coats. Into The Night; has a bit sheer formula and goes opaque in three to four coats. Number One Nemesis; has quite opaque formula and it goes completely opaque in two coats. It has multi colored shimmer in it which makes it so versatile yet unique. Just Spotted The Lizard; has a duo chrome and really smooth formula and it goes opaque in two coats. It reminds me of Ozotic 915 (I <3 this polish). Drying time for all four polishes is pretty fast, so it is a good collection for all who are always in a hurry or have kids running around. Staying power is also super great as they did not chip off for good one week and then I had to take them off. Please note that I do all my house chores by myself so if a nail polish lasts 4-5 days on me without chipping, it is always good. Also, they are mildly scented and except for the pink one, rest do not stain nails. Overall, I am loving this collection but I think 1400pkr for four 3.75 ml bottles might not be a good deal unless you really want to have this specific collection. 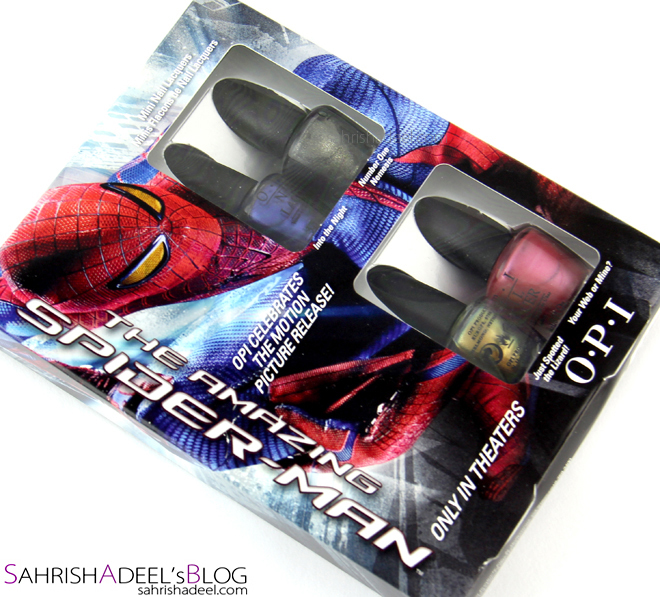 O.P.I The Amazing Spiderman Collection cost 1400pkr and can be bought online from Daraz.pk (Pakistani webstore). Get a 10% discount when you add SahrishAdeel at checkout. They have also started international shipping. I am sure this collection is still available in many countries ranging from 13$-20$. 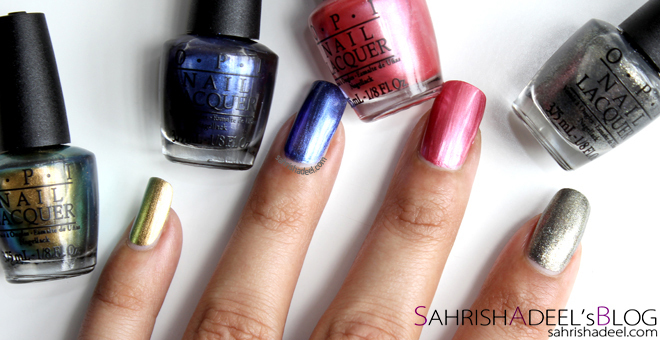 Which one out of these four is your favorite shade?